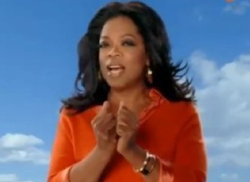 The Oprah Winfrey Network announced that it is overhauling its schedule in the face of low ratings and anxious advertisers. The channel’s most popular series, “Behind The Scenes,” which follows the backstage making of Oprah’s talk show, is being moved from Fridays to Sundays beginning April 27. “Behind The Scenes” will be paired with “Master Class” on Sundays. Following the latter’s end, a reality show about Naomi and Wynonna Judd will air after “Behind The Scenes.” Further celebrity reality shows will be coming soon. In addition, OWN is cutting back on its original programming–from four days a week to three. This goes against what OWN’s chief executive Christina Norman told the New York Times last week: that people want more original programming, not less. The announcement came on the same day that the New York Post reported that OWN executives were trying to calm jittery advertisers, who are nervous about the relatively soft ratings the channel has had since its blockbuster launch in January.